We carry plenty of items to add additional storage to your Club Car Precedent, DS, Carry-All golf cart. 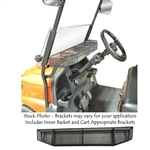 Golfers love our Club Car under seat storage tray and our GTW inside mounting cargo basket. If you use your cart for hunting or shooting sports, add our clay basket, storage basket, gun rack, and utility box (available in steel or diamond plate aluminum. For the ultimate in storage and looks add our Club Car roof rack. Products in this category are by Madjax, Jake's, RHOX, GTW, MJFX, and others.